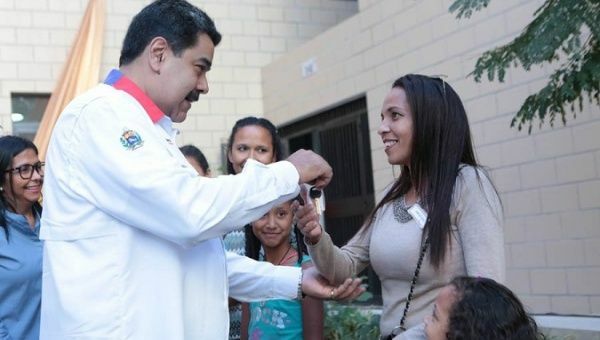 Half of Venezuela’s social subsidy housing system has been completed, President Nicolas Maduro announced Wednesday celebrating the construction of two-and-a-half million homes in the capital of Caracas. “Today we reach the milestone of 2 million 500 thousand homes. Thank you, God. You have to see the effort made by the builders in the country,“ Maduro said during a nationally televised newscast. The goal of Venezuela’s Great Housing Mission (GMVV) is to build at least five million homes by the end of 2019. “All Venezuelans are going to have a decent, beautiful, and proper home. We will achieve it with the Plan of the Homeland 2019-2025. I am finishing the constitutional mandate left to me by Comandante Chávez. The minimum goal is five million homes so that all Venezuelans have decent, fair, necessary, own housing, ” the president said. The next homes were chosen through the Ceret de la Patria, or Homeland Card, a state-regulated mechanism for accessing social programs, have elected the city of Lagunillas in the Zulia state for the second half of homes reserved for impoverished or disadvantaged Venezuelans. Despite the economic difficulties brought on by sanctions imposed by the United States, the Bolivarian nation has continued the task set out by former president Hugo Chavez in 2015. “”You can always do more to improve the country, to recover it. Commander Chávez set a goal of two million homes, but we went further (…) We are going to reach three million, towards the five million homes,” Maduro said. Be the first to comment on "Venezuelan housing plan passes ‘milestone’ with 2.5M homes"